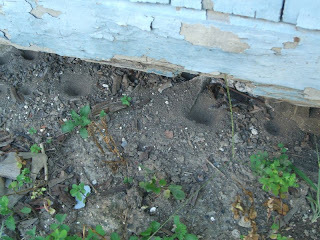 Well that was... an idea...: Can you identify these holes? They're by a section of wood that is largely rotted/eaten away and that is going to be replaced (I hope) in the next couple of weeks. Meanwhile, I'm dreading searching online and finding out that these are clear signs of a _______ invasion where _______ equals carnivorous and unkillable bugs from hell.